"Dirty Mama!!" 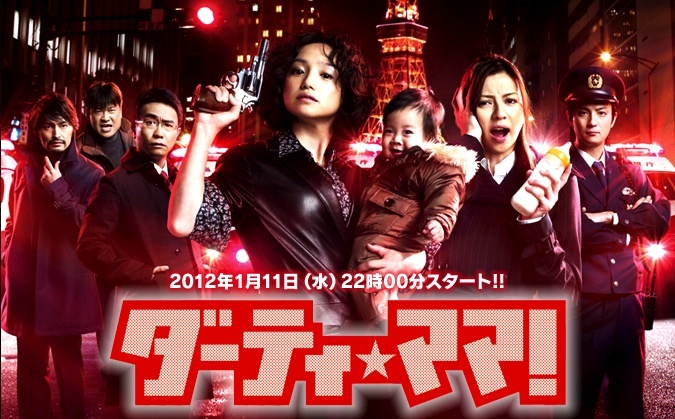 follows single mother Takako, who works as a detective. She possesses the highest rate of successful arrests ..
Takako (Hiromi Nagasaku) is on a waiting list to get her daughter into a public daycare center and private daycare centers are extremely expensive. Because of this, Takako takes her baby to work. She has arguments with the baby's father who does not care about the baby and Takako does not get along with the conservative male detectives. Meanwhile, Takako trains new detective Aoi (Karina). Based on novel "Dirty Mama!!" by Takehiko Hata (first published July 8, 2010 by Kawade Shobo Shinsha). aRinI Dec 04 2011 4:40 pm waaaah rame nich!!! !